Family Reach is at an exciting tipping point! Our team, partners and community grew rapidly in 2017. Experts from across industries – healthcare, finance, retail and beyond – took a stand with us at key conferences. Athletes, cancer survivors and avid supporters held countless events to raise awareness and funds for our families. It stirred our sense of purpose to watch this all unfold, knowing so many feel the same sense of urgency. Together, we are stronger than ever! 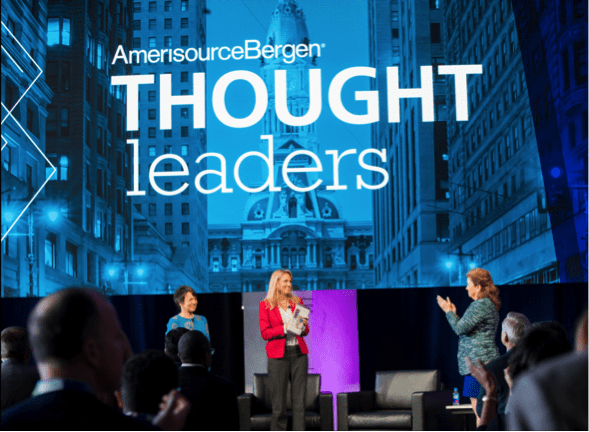 Family Reach CEO Carla Tardif at AmerisourceBergen’s Thought Leadership Conference. We’re proud of all we’ve accomplished at Family Reach to date. But when forces unite, so much more good can be done. Our network banded together like never before in 2017. We announced the newest members of our family, JUST TRYAN IT, in February. We’re working with their talented team to ensure every dollar raised at their kids triathlons is efficiently and effectively delivered to families that need it. By spring, we were joining other changemakers on stage at AmerisourceBergen’s Thought Leadership conference to discuss how we’re working with our partners to redefine what it means to help families with the financial burden of cancer. A big part of this discussion was our Financial Treatment Initiative, an innovative endeavor made possible with the help of Golf Fights Cancer and the Foundation for Financial Planning. It all came together this fall when we hosted the second annual Imagine Session. This event tasked participants with brainstorming ways to address cancer-related financial toxicity from all angles – transportation, food, housing and beyond. Many solutions were born, and we’re taking active steps to put those in place. Celebrity chefs with some of our Family Reach heroes at CookingLive! New York. Our community is our glue. From those who have been with us since day one, to those who are just beginning to know us. You lay the foundation for everything we do. 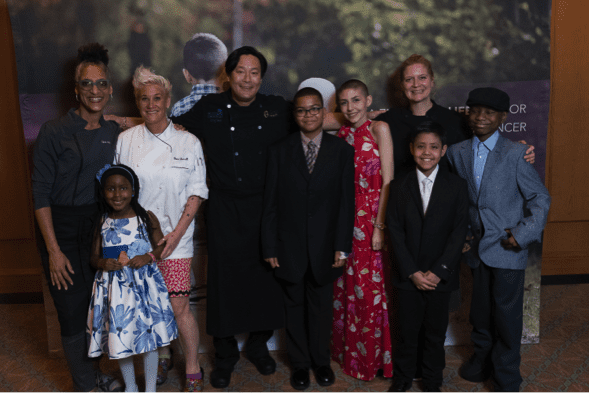 With Ming Tsai, celebrity chef and Family Reach National Advisory Board President, at the helm, the Cooking Live! event series has always been a sure-fire way to generate support for our families. This year we held our first-ever Cooking Live! Yellowstone, featured a family panel at CookingLive! Boston and broke all fundraising records at our 2017 New York event. Other acts of tireless dedication sprung up in 2017. Cancer survivor Michele’s personal call to action with her own network and Elizabeth‘s year of cancer treatment, which she spent dedicated to raising funds for families in need, are just a few of these. Our Reach Athletes also gained new ground. In honor of his daughter, Kassidy, who always offered generosity to those in need, Reach Athlete founder Kenji Freedman rallied teams. From three-hour spin sessions to yoga classes and marathons, this community pushed their limits to reach more families. Each of these events and fundraisers were made possible through the efforts of a community that’s always asking how they can do more for families fighting cancer. As the year comes to a close, we feel a deep sense of gratitude at the outpouring of support 2017 carried. You are part of a mighty, fearless and passionate group that is changing the face of cancer! We’re eager to kick off 2018 and will be unveiling many updates in the months ahead. Stay tuned!